...... With a few minutes of work, you'll have an eye-catching slide show with background music and transition effects. Socusoft iPod Photo Slideshow supports Over 260 amazing transition effects with Pan Zoom effect. With iPod Photo Slideshow , thousands of pictures from holidays, landscapes, wedding or family parties can now be enjoyed on iPod, iPad, iPhone, PSP, Archos, YouTube, Facebook, MySpace or more multimedia platforms as eye-catching slide show. The program's simplified three-step workflow enables users of all levels to build custom slide shows for sharing on iPod with family, friends or customers. iPod Photo Slideshow make iPod playable (MPEG-4) photo slide show. Photo to dvd slideshow software. Watch your pictures on any home DVD player. Is a digital photos to DVD Movie program. An innovative facility to create your photo and video movie for iPod. Converts digital photo and video to iPod MP4 files. Create DVD Photo Slideshow from your photo album to watch on TV. A tool to burn perfect slideshows on DVD with your digital pictures and videos. Creating a Photo Slide Show with Music and Transitions for any mobile devices. 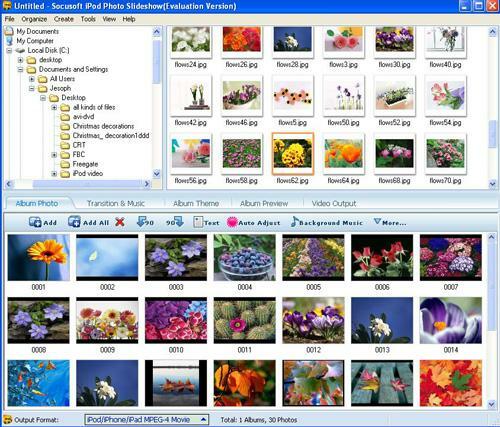 Qweas is providing links to Socusoft iPod Photo Slideshow 8.05 as a courtesy, and makes no representations regarding Socusoft iPod Photo Slideshow or any other applications or any information related thereto. Any questions, complaints or claims regarding this application Socusoft iPod Photo Slideshow 8.05 must be directed to the appropriate software vendor. You may click the publisher link of Socusoft iPod Photo Slideshow on the top of this page to get more details about the vendor.